Akira's still happening! Plus Terminator's Kyle Reese is almost cast! 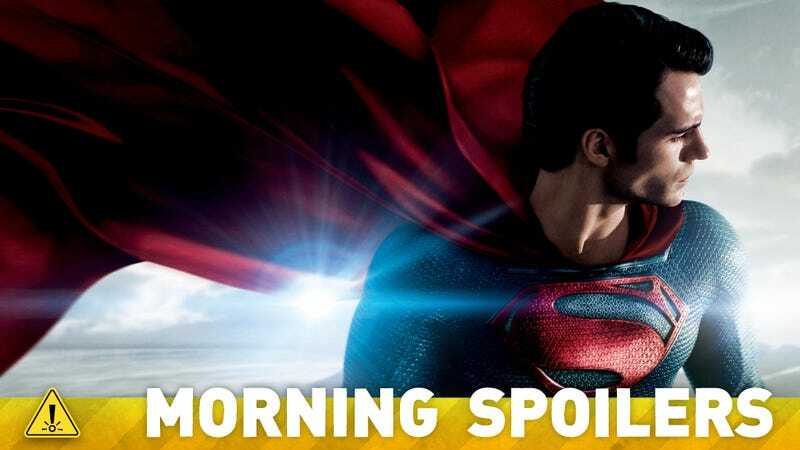 Zack Snyder explains how Frank Miller's Dark Knight Returns will be incorporated into Batman Vs. Superman. Jurassic World will explain why the dino-nightmare keeps happening. Roberto Orci wants to put Ichabod on a plane in season 2 of Sleepy Hollow. Plus first looks at Sif on SHIELD and Rapunzel on Once Upon a Time. Spoilers now! Top image: Man of Steel. According to Deadline, the role of Kyle Reese is down to either Jai Courtney (A Good Day to Die Hard) and Boyd Holbrook (The Host). Whoever gets it will be joining of the already-cast Emilia Clarke (Game of Thrones) as Sara Connor and Jason Clarke (Zero Dark Thirty) as John Connor. The comic book will influence the history of Batman vs. Superman, on which the writer David S. Goyer and myself will work. Ben brings an interesting counterweight to the performance of Henry in the role of Superman. He has the experience necessary to paint the picture of an older and more advised man than Clark Kent, who bears the scars of a seasoned vigilante while retaining the charm that Bruce Wayne deploys when present in the world. He's got a little of both. He's got a little bit of the Goldblum cynicism but also the Sam Neill excitement at the wonder of the biology of it all, so it's a combination. Like, how do you suspend disbelief to be like, 'Oh yes, let's make this mistake again. We haven't learned our lesson about dinosaurs, we should definitely live with them and see how that works out!' after like three tries at it. They answer the question really well through the script. Colin did a great job of writing it and justifying it and in his own way having fun with that, so anybody who goes in with that question will be really amused - the way I was - about how they answer that. It's great that they're waiting for me. It's different, because you have to be respectful of the source material. Otomo adapted his own work from a manga into an anime and both things are completely different and genius. The only way to do a live version of "Akira" is to take the spirit and adapt it. It will be as different as the anime was from the manga. I think you cannot make a movie about "Akira" and hope that everyone understands it. Like everything else, you have to make three or four movies in one where there's the essence somewhere. If you're a fan, you already know what it's about and you'll see it's part of the same world, but trying to oversimplify it would be a mistake. I think if at some point a character tries to explain it to the audience at the end of the second act, that's a problem. It's more like an existential opera. It's something that can only be explained in the manga, and even in the anime it's hard to follow. When Vee is picked to be a player in Nerve, an anonymous game of dares broadcast live online, she discovers that the game knows her. They tempt her with prizes taken from her ThisIsMe page and team her up with the perfect boy, sizzling-hot Ian. At first it's exhilarating–Vee and Ian's fans cheer them on to riskier dares with higher stakes. But the game takes a twisted turn. Suddenly they're playing all or nothing, and the prize may be their lives. No, it's so needless. And I think it drives the whole second half of the season for her because we never see her process anything. But by virtue of her actions you can tell that she's processing. Maggie doesn't really know where any of her people are right now. That drives the whole back half of the season for her. And for everyone. She's not getting the chance or the time to process. But it's going to be filthy. This is definitely going to be the goriest yet. You really see how far she can go for what she is fighting for and for the things she holds dear. This is the first time you see Maggie on her own, and with everything that she's learned and the evolution of this character, how prepared she is for this world. And it turns out she's pretty prepared. [Laughs] But its been an insane adventure, a turn in the story that none of us anticipated. All these episodes are gems, complete gems. It's been a real treat for all of us. It's been really tense. And we've gotten to explore our characters in different situations with different people sometimes, and sometimes with no one. It's been a great opportunity to test our mettle. I looked up the interpretation of dreams and I had already decided what the dream meant and I looked it up and I was right. Her subconscious is forcing her to metabolize her grief and if you won't do it when you're awake then your subconscious might force you to do it when you're asleep. The idea of remembering holding her son or having a loving moment with her man is not something that she's willing to revisit in her consciousness, and she's shut it completely down. So that's why she keeps away from Judith. But the idea is there is too much trauma going on, so you have to process it or you might just die. I'm not sure how much I can reveal. It is somewhat in line with what her backstory is in the comic book series and there's definitely more that will be revealed as this season goes on, but this is what we've had in mind for this character since the very beginning. There've been other ideas and plotlines thrown out in the writers' room, but it was always the plan to reveal that the Mike and Terry characters, her boyfriend and her boyfriend's friend, were her [zombie] pets. There are going to be more layers revealed about how that came about and what lead to that. But that has always been our backstory and it's great to finally have that revealed on the show. Yeah, there are certain things where I can look back with hindsight having done the comic. That's one of the most fun aspects of being in the writer's room. I can say, I did the story this way and the audience reacted this way. Deconstructing things from that point of view and really being able to game them out long-term is a lot of fun. There are a lot of times in the comic book where people don't notice it because the panels don't move, but Rick is standing on top of something he would not have been able to climb on without a hand… It'd be more difficult to do that in the television show. All that being said, I'm not ruling out the possibility that he may lose the hand eventually. It is the beginning of expanding the reach of the storytelling. Also, not just for the mythology and evil coming to town, but Ichabod [Tom Mison] seeing the rest of the world is just a fascinating thing to do. He's only seen [so little] of our modern society through the lens of a town that resembles his own town to a great degree, except more Starbucks. Opening it up is absolutely something we hope to do.
. . . He's been in this town the whole time and he's adapted very well, but I'd like to see his reaction the first time he gets on an airplane," Orci says. "We were joking that he thinks, 'Oh, are we driving all the way there in this thing?' And then the plane takes off. Imagine seeing the White House and all the stuff that he never got to see that are the fruit of his labor and his sacrifice. Things like that will blow his mind. We always have our radar up for ways to tie our series into the Marvel films and bringing in an Asgardian really cements that connection. Lady Sif comes here on a hunting mission — sent by Odin — to find her arch-enemy Lorelei and bring her back to Asgard. It throws our agents for a loop when they find themselves in a fight right alongside this powerful woman from Thor's world. We went a little darker and freakier. A little more horror story in the vein of [the 2004 movie] The Grudge. In this season so far Monroe had a very interesting chemistry with Charlie. There was definitely a spark, as impossible as that might sound. How will Connor's and Charlie's quick interlude mix things up for these three characters?